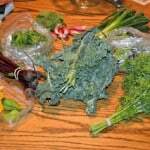 This is the first week that I haven’t been able to go and get our CSA. I’m back to work so my husband has to go get it on Fridays. I really miss not being able to pick it up and then go to the farmer’s market. I’m lucky enough that my husband can still go and I can send him with a list of things I’m looking for. 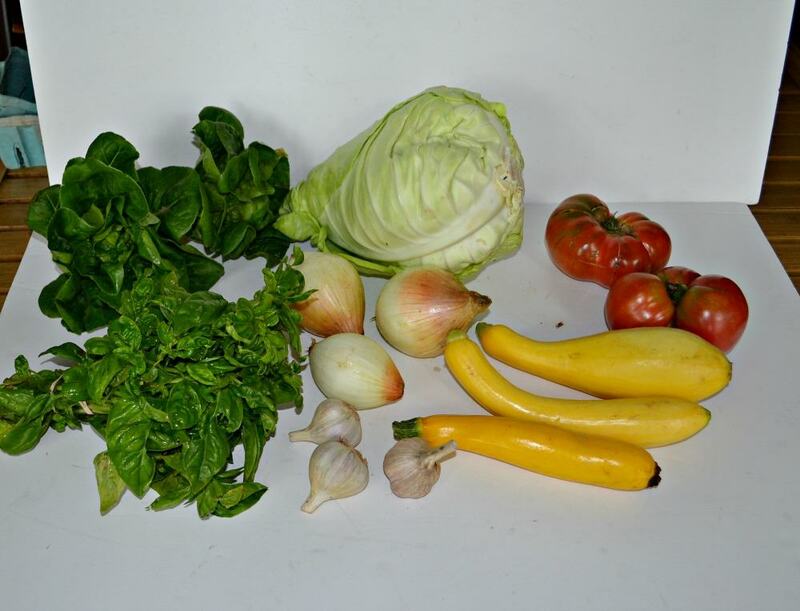 This week we received 2 heads of lettuce, the biggest cabbage you’ve ever seen, 2 huge tomatoes, a large bunch of basil, 3 onions, 5 garlic cloves, and 3 yellow squash. Not the biggest bunch we’ve had, but things we’ll use. The lettuce went to make a fresh salad. The cabbage was used for cole slaw and Korean Beef tacos. Then I needed to find a use for the tomatoes, onions, garlic, and squash. I wanted to turn them into a vegetable side dish. This is one of the best vegetable side dishes I’ve had in a while and it made great use of the tomatoes, squash, garlic, and onions. I don’t even like tomatoes but these homegrown beauties were amazing. 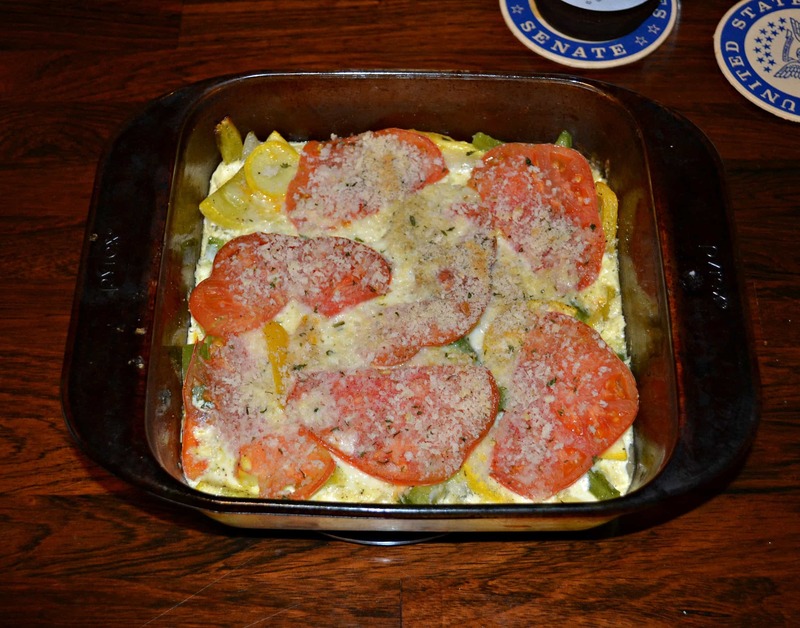 I mixed the vegetables with some milk, egg, and cheese and it made a delicious, fresh tasting casserole. 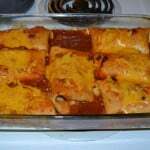 It turned into a wonderful vegetable side dish with a slightly cheesy flavor. This is a great way to use vegetables from the CSA. Heat the oil in a skillet over medium heat. Add the onions, peppers, squash, and garlic. Sprinkle with salt and pepper. Saute for 5 minutes or until just beginning to soften. 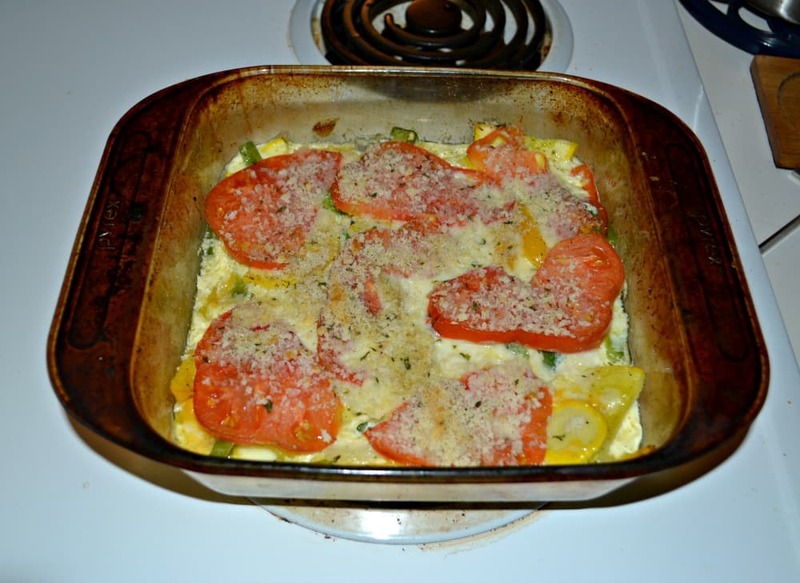 Place the softened vegetables in a 9" square baking pan. 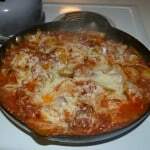 In a small bowl combine the milk, mozzarella cheese, and egg. Mix well and pour over top of the vegetables. 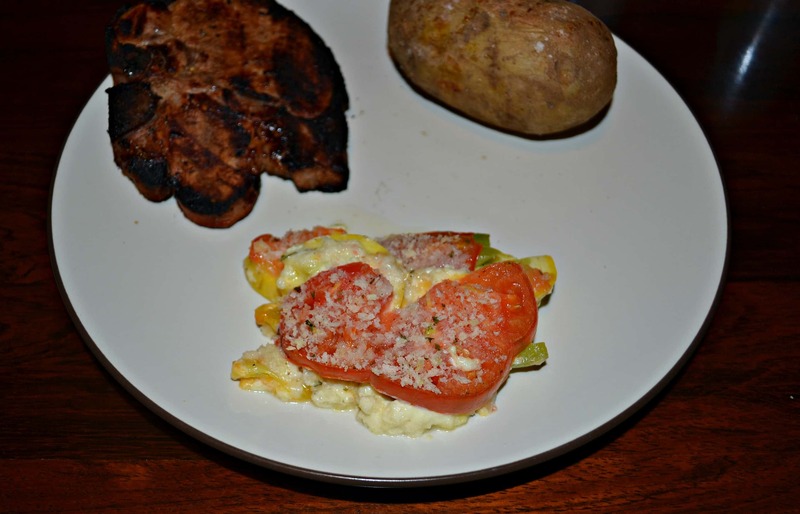 Place the tomato slices on top of the vegetables. Sprinkle with the panko breadcrumbs. Bake for 25-30 minutes or until the breadcrumbs have browned. « #ad Game Day with Tyson Deli Wings and Dipping Sauce!